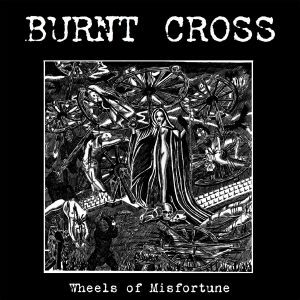 Burnt Cross – Wheels Of Misfortune Out Now! Burnt Cross are back once again with what will most likely be their last release, a 12″ compilation of their last four 7″s (plus a couple of unreleased ones) that comes with a huge 65cm x 65cm poster (kinda like the original Crass records used to). Once again all recorded totally DIY in Rob’s Bedroom on an 8 track. 19 tracks on black vinyl. You can pick up a copy for a fiver plus postage on our webstore and you can check the record out online here (Youtube link).